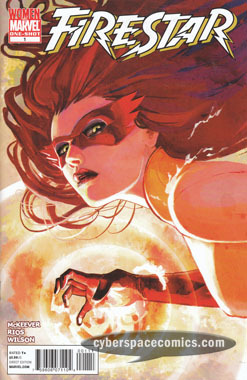 Firestar (Angelica Jones) has used her microwave-controlling powers to make the world a better place as a member of the New Mutants. In recent years, she’s discovered that her microwave powers have encouraged cancer to develop early in her young body. In 2009’s Marvel Divas, she battled the cancer into remission but she’s currently undergoing chemo treatments to keep it in check. And, when duty calls, she continues to use her powers for good … even though it’s possible that they’re continuing to negatively affect her. In this one-shot (her second solo title in 24 years! ), she’ll have to help out Cassie Sandusky, a girl who used to pick on her in school. Cassie’s currently going through a difficult divorce and has developed a drinking problem. Angelica finds that, even though these are issues her powers can’t fight, she’s still got the ability to help someone in need. As always, Sean McKeever delivers with his talented knack for writing believable and realistical dialogue. It’s engrossing and really helps the reader to feel for these characters. The artwork has a manga-inspired look that doesn’t quite deliver to the standards of past-McKeever-partner, Takeshi Miyazawa, but it doesn’t detract from the story. And, the cover doesn’t strike me as incredibly-inspired, either. (I mean, these things are what’re supposed to jump off the rack and scream “Buy Me!”) But, artwork aside, I really enjoyed this look at one of the few female super-heroes that I like checking in on from time to time. Oh! And, what do you know? The last page says she’ll be appearing regularly in the an upcoming title written by Sean McKeever, the Young Allies. I’m there!